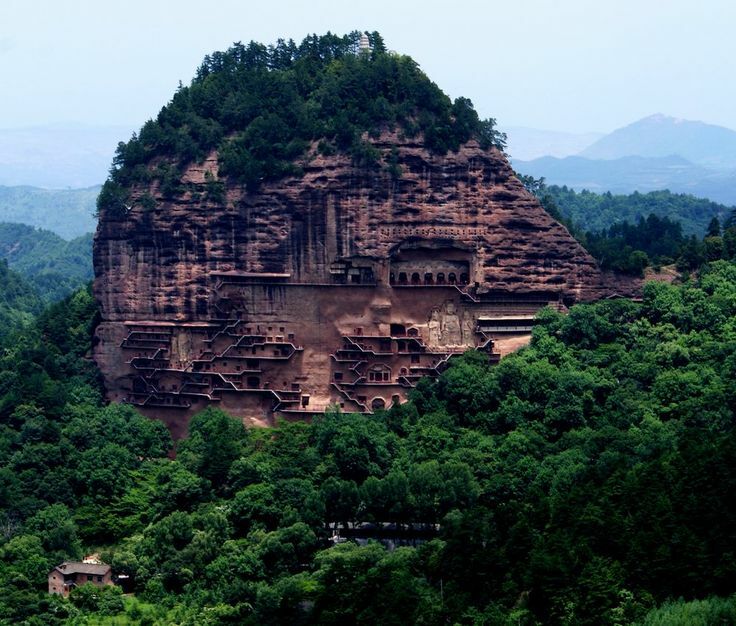 Maps have a special role and meaning for fantasy novels. For one, they are often needed to orient readers to crazy, new worlds; but to make the fantasy-world be realized, I decided to depict the maps for Dyscrasia Fiction real landscapes (not common cartographers' maps). 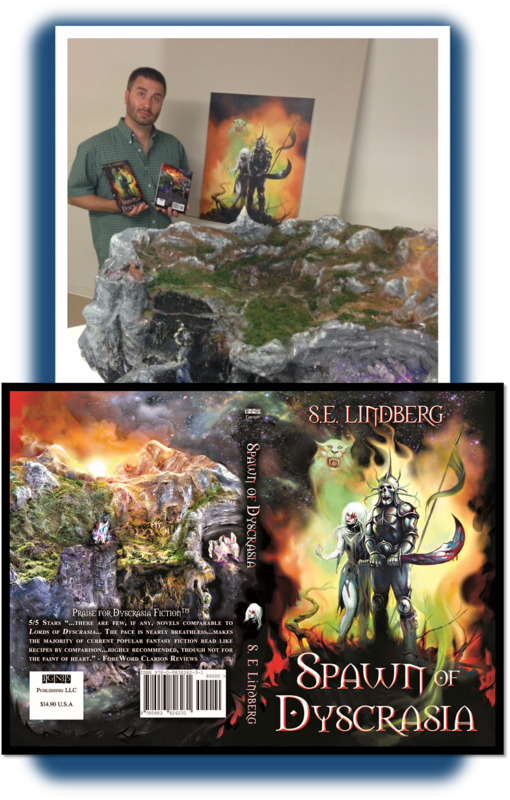 Below, the color version of the Land made for Spawn of Dyscrasia (publication in process Summer 2014) is a photograph of a 5' x 3' diorama constructed in my basement. This post details the making of it. First, note that there is no compass rose; instead, the sunrise indicates East. 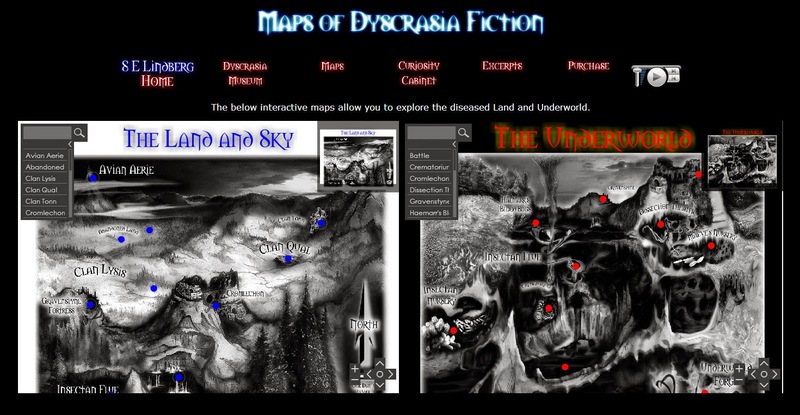 The predecessor Lords of Dyscrasia had maps that appeared as hand-drawn sketches of the same landscape, which were used to guide the scaling (they are available online too as interactive maps--link). New places are featured in Spawn of Dyscrasia, and old places have evolved. It was important that each key area was identifiable and unique, just like a living person. 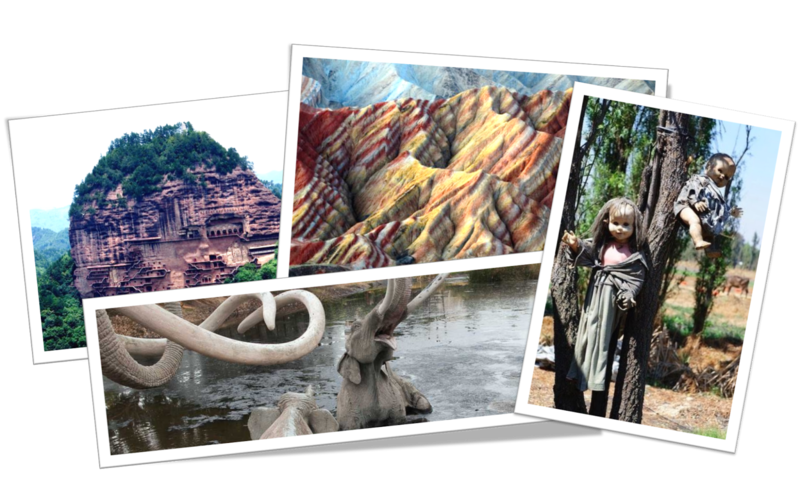 I drew inspiration from real places with haunting beauty such as: the colored sandstone of Zhangye Danxia, China (for the Arenite Range), the Island of the Dolls, Mexico (For the Gray Orchard), the Maijishan Grotto, Gansu, China (for the Chromlechon Keep), and the La Brea Tar Pits, California (for the Blood Bogs). 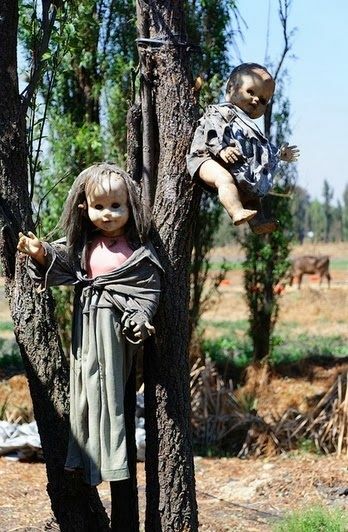 La Brea is the only site I saw in person, the others are on my bucket list. Then the fun began. 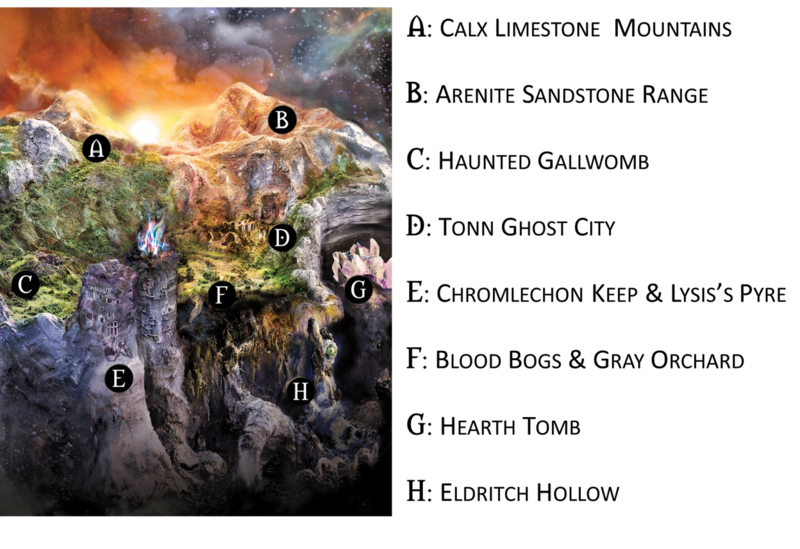 The existing map of the Land was drawn on a large foam core board. Then pictures of the key places were laid out. 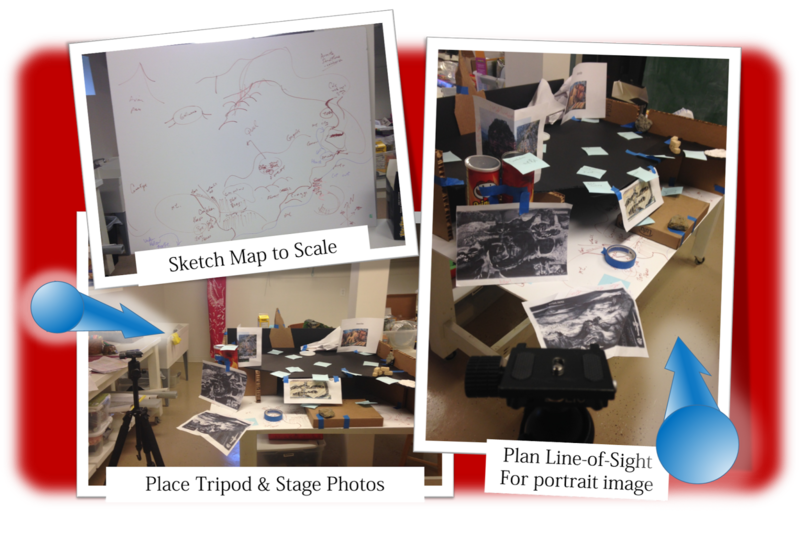 From the beginning, the desired output was a map that fit a portrait page design (to accommodate print and eBook viewing). It was critical to plan a vantage for photographing this, and the topography was tweaked to present the desired perspective. The tripod placement was decided early on to capture a cross-section of the Underworld and the key Land features. 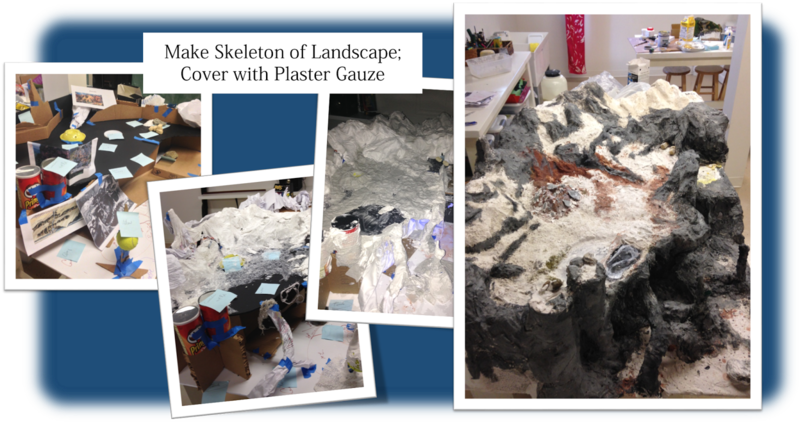 Then newspaper, bubble-wrap, and cardboard were used as skeletons for the mountains and terrain. All was coated in plaster-coated gauze. Successive coatings of plaster and paint consumed weeks. An undercoat of gray and brown blocked out terrain types. 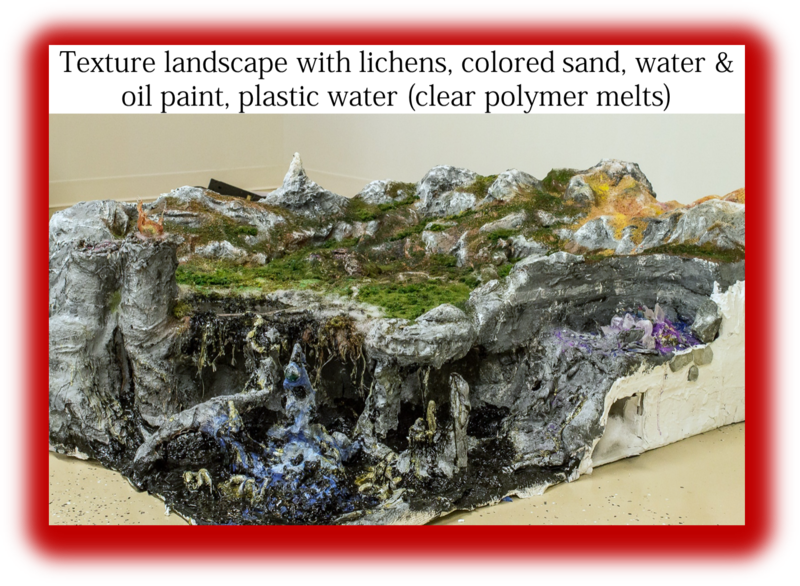 The surface was coated in all sorts of crafty materials: trees were made from lichens, colored sand was used for the sandstone range, diorama-friendly powdered grass and faux bushes polished off the vegetation; polymer melt faux water was used for the Pyre atop the Keep and the Underworld sea of oil. Mixing black-oil paint with white-aqueous paint made for some wild textures since the "gray" would phase split during painting, and the black oil would slowly bead atop the white. 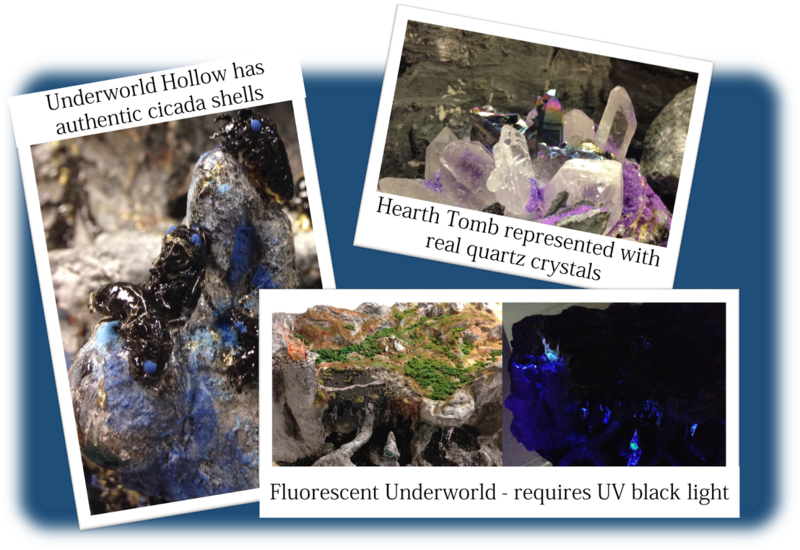 There are all sorts of details not accessible from the photo, including real cicada shells in the Underworld, fluorescent paint around the magical areas (which require a black light), and real minerals for the crystalline tombs of Clan Tonn. Luckily I know a competent photographer. 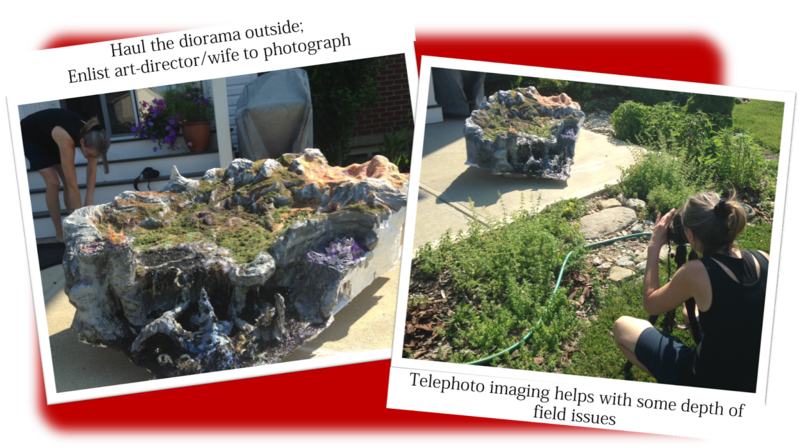 My art-director and wife Heidi imaged the diorama from all sorts of angels and lighting. She preferred natural light, with strong shadows from the setting sun...so we hauled the beast outside. It is amazing how many photos were taken. In the end, I took the one taken from the initially designed vantage, but weaved in close-ups (digital magic via Photoshop) to ensure it was all in focus. With a color map in hand, I was ready to complete the cover. Understand, that the only way I could provide a color copy of the book (and keep it affordable) was to incorporate the map on the back of the cover (the interior is all black and white). It took some creative thinking, but the fire from Ken Kelly's masterpiece art was weaved into the backcover landscape. Print copies will be available soon (Sept 2014, available globally via online retailers like Amazon, BN.com, etc. ), with eBooks too.